SONGKHLA - More than 30 bodies are being pulled from shallow graves at a human-trafficking camp near the Malaysian border with the national police chief saying 20 more could be found. 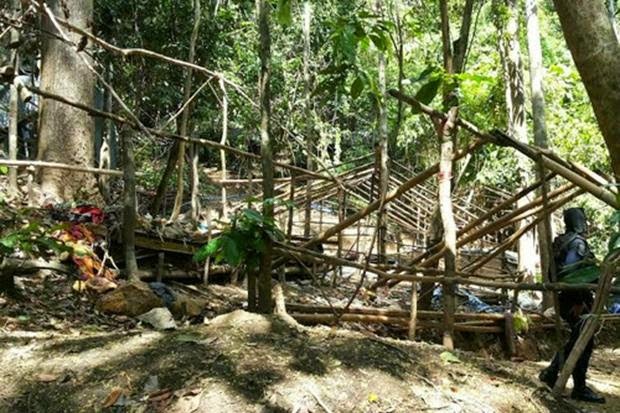 Pol Gen Somyot Pumpunmuang said he had received reports from Songkhla provincial police and soldiers of 50 graves at the remote camp located in a mountainous jungle section of tambon Padang Besar in Songkhla's Sadao district. Most of the dead are suspected to be Rohingya Muslim refugees from Myanmar who starved to death or died of disease while awaiting payment of ransoms to be smuggled into Malaysia by a trafficking comprised of Thai, Myanmar and Malaysian nationals. Pol Gen Aek Angsananont, the deputy national police chief, said the temporary shelter, covering about one rai of land, has a bedroom and a canteen. It is only 300 metres from the northern Malaysian state of Perlis. "This location helps traffickers transport the migrants at anytime and it is difficult for officers to arrest them," he said. The camp is so close to the border, authorities are trying to determine if it resides on Thai or Malaysian soil. Officials were alerted to its existence by a Malaysian who stumbled upon it, Thai media reported. Reports quoted investigators as saying that the camp held 200-300 Rohingya migrants. Pol Gen Somyot said, however, called it a detention centre for migrants. Traffickers usually set up camps in random locations to avoid authorities, then leave behind any sick or dead when threatened with detection. Sathit Kamsuwan, of the Maikom Sadan municipal rescue service, told the Phuketwan website that authorities had to trek 50 minutes up a hill to reach them. ''About 200 Army, police and rescue workers have had to climb on foot for 50 minutes up the hill into the jungle,'' said. Some of the bodies were buried, while others were covered with clothing and blankets at a shelter in the mountains of southern Songkla province, police Pol Col Weerasant Tharnpiem told The Associated Press. So far, 33 bodies have been unearthed and have to be carried on, as vehicles cannot reach the grave sites. Rescuers found one person still alive. He was said to have been left behind as the traffickers fled and was extremely emaciated. Authorities said they suspect there could be around 50 bodies buried at the camp.